Getty Images/Business InsiderCanadian Prime Minister Justin Trudeau and Saudi Arabia’s Crown Prince Mohammed Bin Salman. Saudi Arabia has expelled Canada’s ambassador and frozen all new trade and investment with Ottawa over an escalating dispute centered on jailed human rights activists. 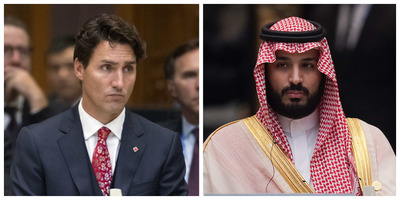 The feud appears to have begun on Friday, when Global Affairs Canada tweeted that it was “gravely concerned” about a new wave of arrests in the Kingdom targeting women’s rights activists. In response, Saudi Arabia issued a fiery statement and gave Canada’s ambassador 24 hours to leave the country. Saudi Arabia has come under scrutiny in recent months for arresting several prominent women’s rights activists just weeks before lifting its longstanding ban on women drivers. Saudi Arabia has expelled Canada’s ambassador and frozen all trade and investment with Ottawa over an escalating dispute centered on jailed human rights activists. The feud appears to have begun on Friday, when Global Affairs Canada tweeted that it was “gravely concerned” about a new wave of arrests of women’s rights activists in the Kingdom. “We urge the Saudi authorities to immediately release them and all other peaceful #humanrights activists,” the tweet said. The tweet was later shared on the Canadian Embassy in Saudi Arabia’s twitter page, which appears to have further stoked tensions. The surge of arrests began on May 15, and appear to target prominent women’s rights activists who previously campaigned to abolish the country’s driving ban against women. Canada’s tweet referenced the most recent stream of arrests last week which included award-winning rights activist Samar Badawi, who is best known for challenging the country’s restrictive male guardianship laws, Human Rights Watch reported. Alex Wong/Getty ImagesIn 2012, Samar Badawi was presented with an International Women of Courage Award by former US Secretary of State Hillary Clinton and former first lady Michelle Obama. Saudi Arabia’s foreign ministry fired back in a strongly-worded statement released to the official Saudi Press Agency on Monday, condemning Canada’s meddling in its domestic affairs. “The Saudi Ministry of Foreign Affairs has expressed disbelief by this negative unfounded comment, which was not based in any accurate or true information,” the statement said. Saudi Arabia has given Canada’s ambassador 24 hours to leave the country. The Kingdom said it was also putting a hold on all new business and investment from Canada, and hinted at further diplomatic action. “The Kingdom views the Canadian position as an affront to the Kingdom that requires a sharp response to prevent any party from attempting to meddle with Saudi sovereignty. It is quite unfortunate to see the phrase ‘immediate release’ in the Canadian statement, which is a reprehensible and unacceptable use of language between sovereign states,” the statement added. The United Nations has expressed concern over the Kingdom’s wave of “arbitrary detentions of human rights defenders,” and estimates that at least 15 Saudi activists have been arrested since May 15. Many are worried that the actual number of unreported arrests may be higher. Saudi’s Press Agency said the activists were arrested for seeking to “destabilize the Kingdom,” though many remain in detention without charge, Human Rights Watch said.